How should we pray? This is a question that I have been asked several times. Often when men come to an understanding of justification by Christ alone and rejoice in God’s determination of all things, this is a question that almost immediately arises. It is also asked by skeptics that hope to destroy those who rejoice in the accomplished salvation of Christ. I’m sure it’s no surprise to my readers that I being the "harsh, intolerant, and judgmental" one think the prayers of most men are pathetic. They are self-centered which is simply a symptom of a self-centered gospel. I remember an old church which I used to attend faithfully. Almost every wednesday without fail, all the members of the church would gather to have a prayer meeting. The theme of our meetings consisted mostly of praying for what we thought we needed and of course praying for the salvation of those we loved. In other words, we were actively engaged with idolatry. The prayers of most professing christians are flat out idolatry. Men by nature are obsessed with themselves and won’t even think of praying until the hardships of this world become too great to bear. They look only to a god of their own imagination to help them out of their pinch. They are not praying to the Sovereign “I AM” who does whatever He pleases. No, that would be like to praying to a monster they say! A lot of so called calvinists claim they rejoice in praying to a Sovereign God. After all, they pray for the Lord to heal them of their sicknesses and save those they think are “lost.” I remember attending prayer meetings and even saying “amen” to men who prayed for the salvation of all who are alive! Our prayers of course should be that all of God's elect sheep are brought to faith in God's time - not something that is clearly against God's purpose. If anything, we should be praying that we are given the ability to comprehend God’s plan of salvation from Genesis to Revelation and if called upon to faithfully proclaim the Gospel with honesty and clarity. The biblical model for prayer starts with worship and adoration, “Our Father who art in heaven, hallowed be thy name…” Prayer is about thankfullness and rejoicing in the truth. It’s about being thankful for whatever God has done. It is about placing God above man. Whatever occurs in the life of the believer is for his good being purposed by God and we like Paul should be thankful for whatever situation in which we find ourselves. Paul did not complain when he received that thorn in his flesh as it was put there for his good. I can only imagine how he praised the Lord for his infurmities. When we find ourselves in sickness, how exactly should we pray? David prayed, “It is good for me that I have been afflicted; that I might learn thy statutes …. I know, O LORD, that thy judgments are right, and that thou in faithfulness hast afflicted me. (Ps. 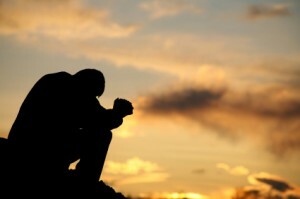 119:71,75)” He didn’t devote prayer meeting after prayer meeting to his sickness. No he thanked God for his sickness! Imagine that! There have been times in my life where I found myself sicker than a dog. For example, I have spent hours by the toilet vomitting with a bad case of the stomach flu. It’s not a pleasant experience at all! I do not look forward to the next time it happens. But if or when sickness aflicts me again whether it be cancer, hepatitis, or the common cold, I hope that I am brought to the point where I can lift my head up and thank God like David for my afflictions. God’s afflictions can be just as much a blessing as His healings, and we should never forget this. What should we pray for then exactly? “Thy will be done.” We can request it. We can also STATE it. Now I once heard a preacher state that we should only pray for God’s will of “desire” as opposed to His “decretive will.” In other words, we should pray for what we think God wants! I disagree that there are two wills of God. But in a sense, I agree that we should pray for God’s will of desire because what He “wants” or “desires” is exactly what He has decreed! He does not desire something that He cannot have. He does not desire something that He will not do. Then why do we pray, “Thy will be done?” Because He knows what’s best. We pray this because whatever He does is the best thing that could ever happen! We pray because we love God and should not be satisfied with anything less than His desires. Rev 19:1-3, (KJV), And after these things I heard a great voice of much people in heaven, saying, Alleluia; Salvation, and glory, and honour, and power, unto the Lord our God: (2) For true and righteous are his judgments: for he hath judged the great whore, which did corrupt the earth with her fornication, and hath avenged the blood of his servants at her hand. (3) And again they said, Alleluia And her smoke rose up for ever and ever. In heaven, we will see things more clearly and have a greater understanding than what we have today. Today we see through a darkened glass. Those who do not know Christ look at a shiny mirror and only see themselves. They refuse to even acknowledge their Creator. I beseech all to think about our prayers and not mimick those of the false religionists around us. The heathen name it, claim it, blab it, and then try to grab it; but they fail to rejoice in the Sovereign God of Scripture. Let us not do likewise!